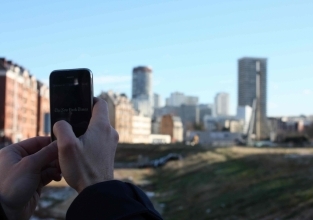 Experimenting with new urban uses, MOB encourages emerging artistic practices related to mobile and wireless technologies. At the crossroads of creation, art education and awareness of technology as mean of expression, the project presents a cross and sensible look on 5 cities in Europe. Thus, artists and citizens are invited to explore new realities and urban changes in Barcelona, Paris, Prague, Timisoara and Warsaw. MOB results in a cross-residence program for artists, local and international workshops, conferences, artistic events, competitions of mobile filmmaking. MOB is European cooperation project, receiving support from the European Commission under the Culture Programme. European cooperation project, MOB comes from the collaboration of five cultural organizations involved in supporting new forms of artistic creation and critical reflection on urban space in Europe: Dédale / SmartCity in Paris (France), Makata / Festival Moving Closer in Warsaw (Poland), CIANT / Enter Festival in Prague (Czech Republic), Hangar in Barcelona (Spain) and the French Cultural Centre / Strad'art Festival in Timisoara (Romania).